Enchanting vocals and fresh arrangements of timeless standards from the 20's, 30's and 40's. 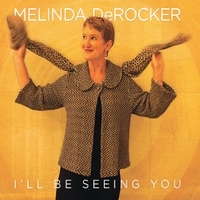 With the debut of her first album, "I'll Be Seeing You," Melinda DeRocker brings fresh and beautiful arrangements of timeless standards, with a roster of New York-based jazz musicians supporting her superb vocals. Melinda is a trained singer, with a classical and musical theatre background who has moved seamlessly and gracefully into the standards genre as if she'd been singing these tunes for years. Ms. DeRocker sings with warm, clear tones, that draw the listener in. With perfect articulation and pitch, rich and smooth phrasing, she even adds a hint of her Southern heritage at times. Singing in her mezzo range, she surprises by moving into an occasional high note with beauty and ease. With just enough bite on "I've Got You Under My Skin," to humor and sass in "It Had To Be You," to desire and longing defining "Embraceable You," to pure joy in "Time After Time," Melinda DeRocker and her musical team have thoughtfully and skillfully created 13 "jewels" to present out into the music world.